Luck At First Sight is a 2017 Filipino movie starring Jericho Rosales and Bela Padilla. Aside from Rosales and Padilla, the main cast also includes Jeric Raval, Dennis Padilla, Cholo Barretto, Kim Molina, Thous Reyes, Issa Pressman, and PJ Endrinal. Padilla also wrote the story for the film alongside Neil Arce. In an interview with Boy Abunda on his television show Tonight with Boy Abunda, Padilla said that the idea for the film first developed while she was in her car listening to the radio. The radio hosts were talking about luck and that's what inspired Padilla to write and develop the story for the film. The screenplay was written by Ays De Guzman. 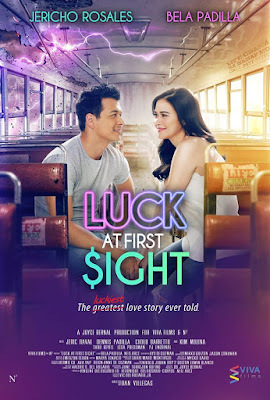 Luck at First Sight was directed by Dan Villegas, the same director behind the romantic films English Only Please, The Breakup Playlist, Walang Forever, Always Be My Maybe, How to Be Yours, and Ilawod. Villegas has also worked in television programs namely On The Wings Of Love, Till I Met You, and Ikaw Lang Ang Iibigin. In 2015, Villegas won the Best Original Story award at the 41st Metro Manila Film Festival for his work on Walang Forever. Villegas is also an accomplished cinematographer. His cinematography credits include She's Dating The Gangster, She's The One, Quick Change, Bakit Hindi Ka Crush Ng Crush Mo, and Unofficially Yours. The movie's tagline: "The greatest luckiest love story ever told." Luck at First Sight is a project by Viva Films and N2 Productions. Padilla plays a character named Diane while Rosales plays a character named Joma. The movie will be released nationwide on March 22.